Situato ai margini del parco di Villa Pamphili e a 2,5 km da Città del Vaticano, l'appartamento a ristorazione indipendente, è situato al terzo piano con balcone e connessione Wi-Fi gratuita. Arredato e decorato con colori vivaci, climatizzato, dispone di una lavatrice, TV a schermo piatto, di un'area salotto con divano letto e di una cucina completamente attrezzata con lavastoviglie, forno e bollitore elettrico. Offriamo una colazione di benvenuto a base di biscotti, marmellata e caffè; mappe e guide della città. L'appartamento si trova a 2,5 km dal vivace quartiere Trastevere, mentre il Colosseo è raggiungibile in 15 minuti di auto. Aurelio è un'ottima scelta per i viaggiatori interessati a: musei, monumenti e monumenti e siti antichi. Vivo a Roma da sempre, ho 3 figli, una vita movimentata, il lavoro di gestione di questa struttura mi diverte e mi gratifica. Faccio il possibile per andare incontro alle richieste degli ospiti, e mi incanto ogni giorno davanti alla vista della Cupola di San Pietro. Gli animali domestici sono ammessi solo se mansueti e con obbligo di condurli con guinzaglio e museruola nelle parti comuni. Abbiamo soggiornato nella Residenza Pamphili per solo due giorni e ci siamo trovati benissimo. L'appartamento, situato in una zona molto carina e silenziosa, è caldo e accogliente, molto curato, anche nei piccoli particolari. Vicinissimo a Città del Vaticano. I proprietari/gestori sono stati disponibili e gentili. Lo consiglio a tutti coloro che visitano Roma in macchina. Ci tornerò sicuramente. Grazie a voi per averci scelto… E' sempre un piacere contribuire a rendere piacevole una vacanza. A presto! A Perfect apartment to stay in Rome for 2 weeks! 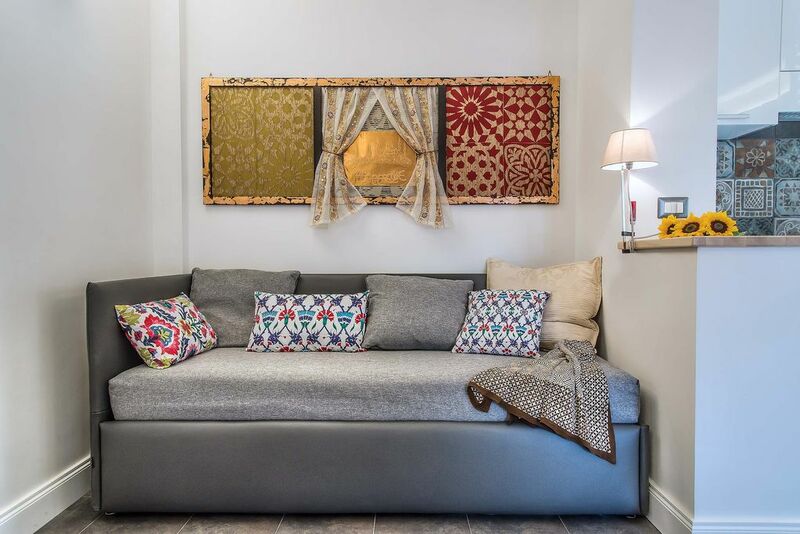 The apartment Fabrics and Residenza Pamphili in general was a perfect place for us (2 adults and 2 children, 11 & 13) to stay during our 2 weeks stay in Rome. The apt was a good size with one double bedroom, bathroom, living room with sofas/sofabeds for 2-3 persons, a well equipped kitchen and a nice big balcony which was great for having coffee or just relaxing in a shade any time of a day. Everything was new and worked perfectly and for us it was like a home where it was nice to have a normal relaxing life after hot days in the historical center and the other sights. In general the apartment was absolutely clean and designed with a very good taste and it was even better than the pictures on the website. Aircon and WIFI were good, too. The staff of the residenza, Daniela & Aisha, were very very friendly and truly ready to help the guests with any kind of everyday questions or problems that may occur. They speak good English so if you don`t speak Italian, it`s not a problem. A top level service, mille grazie! Thank you Tommi, it was a pleasure to meet you and your beautiful family. Your words are our pride, it was rewarding to be helpful. We are very happy that you enjoyed our apartment, since it is made to make you feel home and we achieved our purpose. You surprised us with your very good italian! What else can we say? You were the perfect guests for us! un sejour au calme dans un appartement confortable. l'accueil a été chaleureux. la situation est un peu excentrée mais plusieurs lignes de bus à quelques minutes à pieds rallient le centre ville. nous garderons un très bon souvenir! Merci! ce fut un plaisir de vous rencontrer et ont laissé un bon souvenir. Nous espérons vous avoir à nouveau comme notre invité. Abbiamo trascorso 4 giorni splendidi, l'appartamente accuratamente arredato era perfetto, pulito, equipaggiato di ogni cosa. Personale davvero accogliente e sempre disponibile. Grazie ancora a voi per averci scelto e per le belle parole, è stato un piacere conoscervi e avervi come ospiti, soprattutto aver contribuito a rendere piacevole la vostra vacanza. Vi aspettiamo per la prossima volta e saremo lieti di accogliere anche vostri amici. my wife and i traveled to rome for the first time to visit my daughter, who had been studying abroad. a friend referred me to daniela, the property manager, regarding a place to stay that was close enough to the sites and sounds of the city but offered a quiet place of relaxation. this apartment was the perfect fit, and the service they provided could not have been better. from arranging our travel to and from the airport to the security services we felt very well cared for indeed. while we were just traveling as a couple, the apartment was large enough to accommodate five easily. the apartment itself was exceptional and brand new! we particularly enjoyed the large terrace and full kitchen. the master bedroom was large with plenty of storage for an extended stay. located right on the park, it was a short walk to shopping and site-seeing. for those days we were planning on heading into the city daniela and the staff we able to arrange for taxis, though the public transportation was just around the corner. this was an incredible value for a vacation rental, and we will certainly be back. Really flattered... It's a pleasure to always give the best service we can to make your holiday unforgettable. My wife and I stayed at these apartments in April 2014 and our experience was excellent. The apartment was fully kitted out with everything we needed. It was clean, tidy and modern with all amenities provided. It is situated outside the main city center but a 10 minute bus journey solved that problem. The bus stops right outside and leave every 30 minutes. It was a good price for what we got and the staff were extremely helpful and kind.I can recommend without hesitation. Thank you very much for your beautiful words. It was a pleasure to meet you and have you as my guests. I'm happy that you enjoy the apartment and I really hope to see you again for your next roman holiday. Sull'Aurelia Antica, di fronte alla Villa Doria Pamphili, a 5 minuti in macchina dal Gianicolo, Trastevere e San Pietro. Circondato dal verde, l'appartamento ha il vantaggio di essere in una delle zone più belle di Roma e nello stesso tempo fuori dalla confusione. Girando l'angolo della via, ecco la cupola di Michelangelo 'il Cupolone' come potete vederla solo da qui, da via Piccolomini. Per un bizzarro effetto ottico e di prospettive, più ci si avvicina e più il Cupolone si allontana, mentre indietreggiando si ha la sensazione di averla a portata di mano, tanto sembra più grande e vicina. Da qui potrete vedere la Cupola della Città Eterna come da nessun altro posto a Roma!! Per gli amanti del fitness, Villa Pamphili è l'ideale per il running e per il nordic walking, o per una escursione in montain bike. O solo per sedersi su una panchina a leggere un bel libro.